Erin Brockovich: After Chemical Spill, West Virginians Organizing “Stronger Than I’ve Ever Seen” | Democracy Now! renowned environmentalist, consumer advocate and legal researcher. Today, Brockovich and her team are investigating the major chemical spill in the Elk River, West Virginia. West Virginia has begun partially lifting its ban on tap water five days after a chemical spill in the Elk River. More than 300,000 residents have been unable to use their water for drinking, cooking or bathing since Thursday, when the company Freedom Industries leaked up to 7,500 gallons of 4-methylcyclohexanemethanol (crude MCHM), an agent used in coal extraction, into the water supply. Scores of schools and businesses have been closed, including in the state capital, Charleston. The ban has been lifted in four zones so far, but is still in effect for a vast majority of residents. Dozens of people have been hospitalized since the spill, with symptoms including nausea, vomiting, dizziness, diarrhea, rashes and reddened skin. We get reaction from Erin Brockovich, the renowned environmentalist, consumer advocate and legal researcher. While a single mother of three working as a legal assistant, she helped win the biggest class action lawsuit in American history, holding the California power company Pacific Gas & Electric Company for polluting a city’s water supply. Her story was told in the Oscar-winning film “Erin Brockovich.” Today, Brockovich and her team are investigating the spill in West Virginia. On Monday evening, she held a town hall meeting in Charleston to discuss the spill with local residents. “They’re banding together stronger than I’ve ever seen before,” Brockovich says of West Virginians self-organizing in the spill’s aftermath. AARON MATÉ: West Virginia has begun partially lifting its ban on tap water five days after a chemical spill in the Elk River. More than 300,000 residents have been unable to use their water for drinking, cooking or bathing since Thursday, when the company Freedom Industries leaked up to 7,500 gallons of MCHM, an agent used in coal extraction. Scores of schools and businesses have been closed, including in the state capital, Charleston. On Monday, West Virginia Governor Earl Ray Tomblin announced chemical levels in the water supply are approaching safe levels, but said some residents will be without water for several more days. GOV. EARL RAY TOMBLIN: The numbers we have today look good, and we’re finally at a point where the do-not-use order has been lifted in certain areas. In these specific areas, flushing can begin. We’ve made a lot of progress, but I ask all West Virginians to continue to be patient as we work to safely restore service to the affected areas. AARON MATÉ: The ban has now been lifted in four zones but is still in effect for a vast majority of residents. Dozens of people have been hospitalized since the spill. As of Monday, at least 18 lawsuits have been filed against Freedom Industries and the water treatment company, American Water. 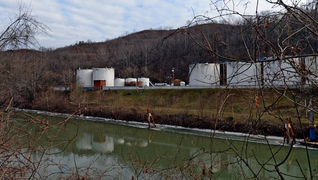 AMY GOODMAN: The spill is also having repercussions beyond West Virginia. The Elk River feeds into the Ohio River, prompting areas of Kentucky and Ohio to shut down their water valves to avoid contamination. The Freedom Industries site behind the spill is just a mile upriver from the state’s largest water treatment plant, owned by American Water. But despite the obvious dangers to the source of 16 percent of West Virginia’s water supply, the spill has exposed major holes in how West Virginia regulates the dangerous chemicals used in its leading industry, coal. The chemical, MCHM, does not receive close federal or state oversight. Environmental inspectors have not visited the Freedom Industries facility since 1991. Under West Virginia law, chemicals storage facilities are not even subject to inspections. The plant also had no groundwater protection plan in place. In a minute, we’ll go to Charleston, West Virginia, to speak with Erin Brockovich, the renowned environmentalist, consumer advocate and legal researcher. While a single mother of three working as a legal assistant, she helped win the biggest class action lawsuit in American history. The suit was against a multi-billion-dollar corporation, the California power company Pacific Gas & Electric, for polluting a city’s water supply. Her story was told in the Oscar-winning film starring Julia Roberts in 2000 called, well, Erin Brockovich. Today, Brockovich and her team are investigating the major chemical spill in the Elk River in West Virginia. On Monday evening, she held a town hall meeting in Charleston to discuss the spill with local residents. ERIN BROCKOVICH: We have found out that the last inspection that was done on this company and that tank farm was in 1991. AMY GOODMAN: That was Erin Brockovich speaking to West Virginia residents in a town hall meeting Monday night, joining us now from Charleston, West Virginia. We’re also joined in Washington by Mike Elk, labor reporter for In These Times. He has extensively covered chemical regulation in the United States, including at the West, Texas, fertilizer plant where 15 people died in an explosion last year. We welcome you both to Democracy Now! Let’s start with Erin Brockovich. You held this town hall meeting last night. What did you find? ERIN BROCKOVICH: Hi, good morning. How are you? ERIN BROCKOVICH: You know what? We were glad we got the town hall together on extremely short notice, because we weren’t even sure if we’d have a facility here. And for the folks that came out, you know, I actually heard numerous stories that were disturbing at many levels, but they were mostly very calm. They were frustrated. They really felt a sense that they couldn’t get through to anybody to give them further explanations, and they had many, many questions that were excellent, that needed answering. I think a couple of things that really startled me were photos that people had taken as the water had come on, the color. There was great concern from people whose water had already come on, the smell. They said that it was pretty overpowering. Nobody told them about that. They were having to open windows, put up fans, just to get the odor out. There was concerns of people who work with homeless groups that had not been getting bottled water, and they were asking questions about—they had been bathing in it because no one sent them bottled water. They had burns on their face. There were people who were showering at the time that still have like some open sores on their heads, who did drink the water before the shutdown that still have some open wounds in their throat. So I think that, you know, as in every single case I’m involved in, there’s just a great deal of information down on the ground with folks that we really don’t know about, we really don’t talk much about. And after, you know, everything’s said and done and everyone goes home, they’re still left with a whole host of problems that they find it difficult to get help with. AARON MATÉ: Erin, based on your past experience with a major company polluting a city’s water supply, I’m wondering if you had any advice for West Virginia residents? ERIN BROCKOVICH: Well, we talked about that last night, and, yes, I do. You know, I’ve zigzagged across the United States since that film came out 20-some years ago, and we run into situations like this every single day, just not to the magnitude of a municipality being impacted and 300,000 people being rendered with no water. And one thing is organization. I think—I don’t think, I see communities just feel helpless. They don’t know how to get through to their local legislators. If they do, you know, they get passed from one person to another. They can’t get through. When there’s a crisis, we all know it’s very difficult to get through. You can wait and wait and wait. And they just feel like there’s nothing they can do. But we have observed, in this new world of social technology, they’re actually very quite savvy on how they’re going to exchange information, where they’re going to learn information. There was people last night in the group that have already started their own Facebook pages. They’re connecting with other Facebook people now. They’re able to see what’s going on. They can reach out more to their community, even if they’re not in the community right at the moment. And they’re helping themselves, and they’re gathering information from one who did hear or got through to an agency, and this is what they told them, and they post that. So, they’re banding together stronger than I’ve ever seen it before. And I think that’s something that’s very helpful to them to stay informed, because when we have information, that’s empowering to us, because we’re able to better have control over our situation and what happens to us. AMY GOODMAN: Erin Brockovich, I want to play a clip of the president of Freedom Industries, Gary Southern, being confronted by Kallie Cart, a reporter for local ABC affiliate WCHS. KALLIE CART: Well, we have a lot—we actually have a lot of questions. KALLIE CART: And it’s been a long day for a lot of people who don’t have water. So, can you give us an exact timeline as to how this all happened? The DEP was saying earlier today, as early as 8:15 yesterday morning they were getting reports and that you all did not call it in until 12:00 noon. The DEP was already here at 11:15. So what’s the timeline on all this? GARY SOUTHERN: We were aware of the leaking storage tank around 10:30. We load tank trucks of this material on a regular basis, and occasionally we’ve had reports of an odor previously. So, we were first aware of any material being spilled at 10:30 yesterday. KALLIE CART: Could it have been earlier than yesterday? Because we’ve also received reports into our newsroom that it was as early as Wednesday, possibly Tuesday, people were starting to smell this in the area. GARY SOUTHERN: We have no information on that. KALLIE CART: Are there no systems in place to alert you of a leak at your facility other than a smell? GARY SOUTHERN: At this moment in time, I think that’s all we have time for. So, thanks for coming. Thanks for your time. KALLIE CART: We have more questions. Hey, hey, hey! No, we’re not done. GARY SOUTHERN: You’re not done. KALLIE CART: We’re not done, no. Anyone else have any other questions? AMY GOODMAN: That is the president of Freedom Industries, Gary Southern, being confronted by a local reporter in Charleston, West Virginia, as he’s drinking bottled water. It sounds a little reminiscent of the former BP CEO, Tony Hayward, in 2010 after the Gulf oil spill, as he drew attention to his own suffering. TONY HAYWARD: We’re sorry for the massive disruption it’s caused to their lives. And, you know, we’re—there’s no one who wants this thing over more than I do. You know, I’d like my life back. AMY GOODMAN: He wanted his life back. Well, let’s stay in Charleston, West Virginia, with Erin Brockovich. This company—we just heard Mr. Southern, the president of the company. I’m looking at Paul Barrett’s piece in Businessweek, “Meet Freedom Industries, the Company Behind the West Virginia Chemical Spill.” “How long has this outfit been around?” he says. “About two weeks, in its current form. Freedom Industries is the product of a merger effective Dec. 31, 2013, that combined Etowah River Terminal, the facility where the leak occurred, Crete Technologies, and Poca Blending, located in nearby Nitro. A predecessor company called Freedom Industries was formed in 1986, according to [our] colleagues at Bloomberg News. How the pieces of the newly formed mini-conglomerate fit together merits urgent inquiry, as does the question of whether there’s any connection between the corporate mash-up and the fateful opening of a one-inch hole that allowed a noxious chemical to escape.” Trying to get behind who is behind Freedom Industries and Gary Southern—does this sound familiar to you, Erin Brockovich? ERIN BROCKOVICH: Well, I mean, oh, my gosh, I wouldn’t know necessarily where to begin. I mean, we deal with so many companies, you know, across the board. Yes. I mean, a lot of things sound familiar. The main one is this laissez-faire attitude that has set in on safety, and across the board. I mean, we could talk about the Tennessee Valley Authority breach we were involved in, the situation with Texas Brine and the sinkhole. You brought up BP. You know, now we have this situation in West Virginia. And these are ones of large magnitude that we really get to take a scope and look at. And sometimes it’s frustrating because I’m not sure we learn anything. And I think we’re at a real critical point where we’re going to have to begin to change how we do business and how we operate these facilities, because they’re everywhere. And so, it is definitely something that we have seen before, their—a great deal of arrogance, not wanting to answer, especially a direct point, that “Were you overseeing? Why is it you didn’t know?” Well, you didn’t know because nobody was tending the farm, if you will. So, there is this almost mentality that we have seen—we’ve seen it with PG&E—that, you know, “I don’t know. We’re untouchable. I’m not going to give you any answers. I really don’t have to.” So, we have seen this type of mentality consistently in most of the work that we’ve done. AMY GOODMAN: We have to break, but we’re going to come back to this discussion with Erin Brockovich, who’s talking to us from West Virginia’s capital. Yes, she is the renowned environmentalist, consumer advocate, well known because of the film by the same name, Erin Brockovich played by Julia Roberts, and for her remarkable work taking on Pacific Electric—Gas & Electric, winning an unprecedented settlement of $333 million for the people of a town that had a similar situation, but talking about contaminated water. And we’ll be joined by Mike Elk of In These Times. Stay with us.